Buy a Season Subscription and SAVE SAVE SAVE! 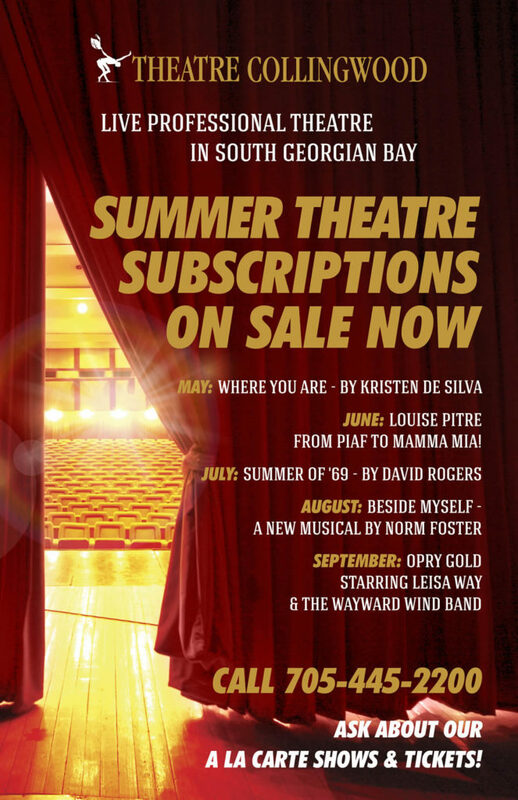 Theatre Collingwood SEASON SUBSCRIPTIONS are a wonderful way to ensure that you have your dates saved for GREAT entertainment. As a subscriber you get first pick at seating AND you save money! Our regular subscriptions include 5 plays, one per month from May to September. If you feel 4 plays are enough for you, you can still purchase a 4-play package. However, if that is the case we really suggest that you still take advantage of the sale price on the 5 plays……. and give one to a friend! When you book your subscription you may want to also look at our shoulder seasons’ plays. In one easy step we can help you to purchase a whole year of plays, book your gala tickets, and even become a Member. If you are worried about the possibility of not being able to make it to a play when you book this much ahead of time, don’t worry. You can choose your dates later. Ordering is easy, just call 705-445-2200 and our friendly staff will be pleased to take your order. They will make sure you have your seats where you want them and that you have picked the best dates and times to suit you. If you have special requirements, want to sit near friends, need help with restaurant choices, or anything else, just ask and we will do our very best to help you. SEASON SUBSCRIPTIONS can be a great way to make sure you get together with your friends and family. It’s always more fun to go to a play with others. So why not talk to your friends and tell them it is time to book their Theatre Collingwood SEASON SUBSCRIPTION, too! Please Note: When you become a MEMBER you do not pay any service charges. This donation really helps us provide great entertainment, and also benefits you!